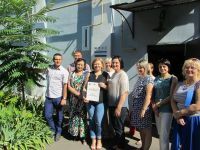 In terms of the "Smart City" component of the joint EU/UNDP CBA Project on 3-5 August 2016 Community Development Specialisy Alexander Ryabyi, Urban Governance Officer Tetiana Kudina and the CBA Project engineer Larisa Batchenko visited partner cities Korosten, Novograd-Volynsky, Nizhyn and Pryluky. 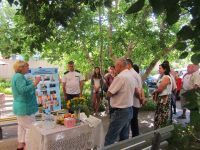 The project team consulted municipalities on "smart cities" micro-projects preparation, checked the documentation, discussed possible risks and expected results. The schedule of works was approved. In terms of the “smart cities” component selected cities will implement such initiatives as interactive medicine, "smart parks", smart systems of voting at local councils, "open budgets", smart city maps, applications for tourists. 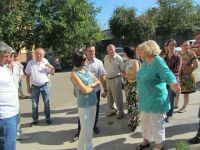 During the visit, the CBA project representatives monitored how the ACMBs implement their microprojects. ACMBs’ members shared their experiences and cases of success.